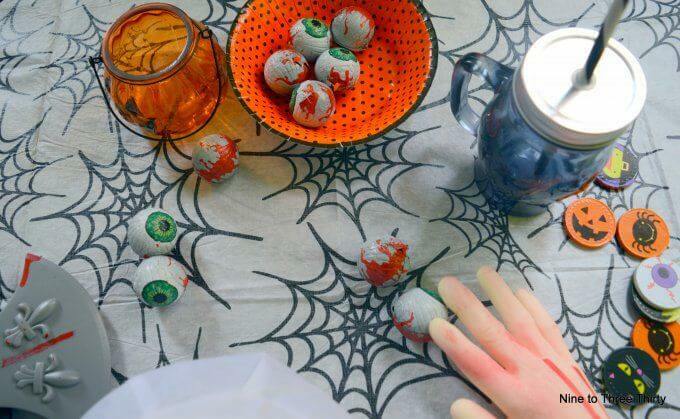 Halloween is always a popular date in our family and it’s become a bit of a tradition that we like to stock up on some new party treats to make the night go well in a creepy way. We are usually on a bit of a budget though and it’s good to be able to find things at reasonable prices when it’s just for one day out of the year. So this year when Poundworld suggested we might like to go for a shop in their store and try out their selection, H was keen to take them up on their offer and we headed off to our local store the other week on a teacher training day. H was in his element and was spoilt for choice in the costume department. 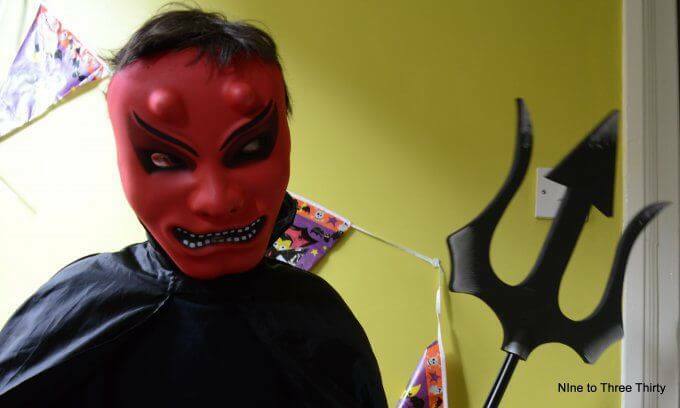 He decided in the end that this would be the year of the devil with this fun red mask and trident. 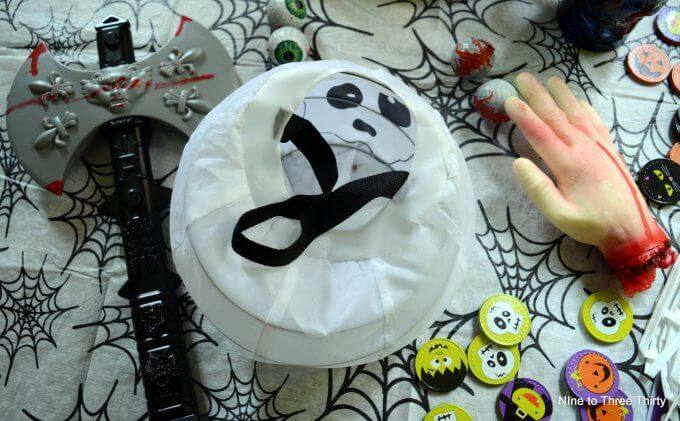 To decorate there were table decorations and table ware like bowls in a Halloween theme. We went for this spider’s web table-cloth, the skull drinking glass and orange polka dot bowls. Of course, for Halloween you need plenty of treats for any trick or treat visitors and we particularly liked the chocolate eyeballs and the spooky themed chocolate coins. They’re good value at Poundworld, so you can get plenty in. You’ve got to have a few accessories too. H felt the need for another weapon and opted for an axe. A severed hand added a touch of realism to his axe related play. Obviously it helps to have a friend to play with and Bracken the cat is usually willing to get involved, so we thought we’d get her a Halloween themed outfit too and of course she needed to match H’s outfit. She looks like the cutest devil I’ve ever seen. Disclosure: This post is in association with Poundworld. Sounds like a great place to get supplies! Everyone looks fab here; thanks for sharing. Lots of great things – will need to have a look! Oh your cat looks brilliant! 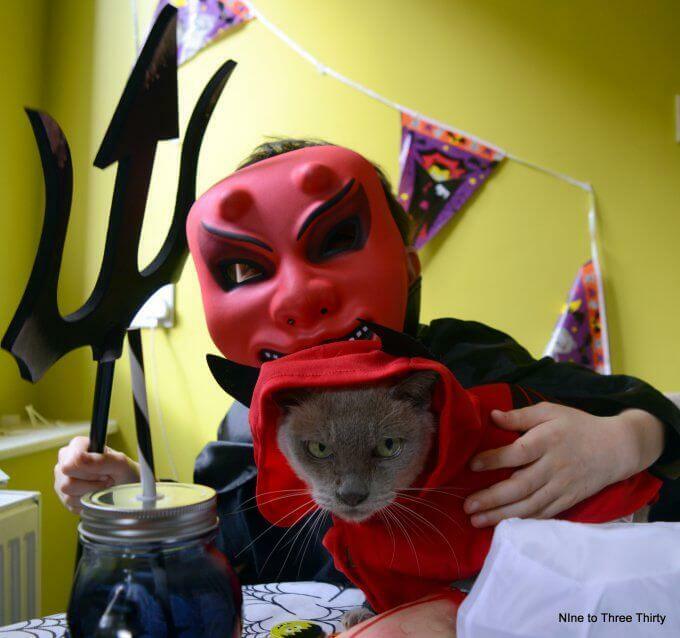 We love the Halloween stuff in Pounfworld – it’s great that they have a mixture of cute and scary too.